I’ve been watching the latest Republican presidential debates. I didn’t watch the debates live because I wanted to see the PBS Nature program on pets, followed by the remainder of the second World Series game. From this experience, I have a few suggestions for future debates, which I list below. Note that this is not a complete specification for future debates. 1. Make the debates more widely available. Debates should be presented on broadcast networks, so people without cable can see them. The debates should be streamed live on the Web and should be available for later viewing on the Web and on demand from cable systems. They should also be broadcast on radio. Perhaps some voters will still not be able to see (or hear) the debates, but most people will. 2. Remove the live audience. We should be interested in what the candidates have to say, uninfluenced by audience reaction. If there has to be an audience, admonish its members to be silent during the proceedings. If people really want an audience that is allowed to react, assemble a Republican audience for Democratic debates and a Democratic Audience for Republican debates. That should be interesting. 3. Ask all candidates the same questions. Although it may be interesting to be able to contrast candidate A’s position with that of candidate B, it is more helpful to know what all the candidates have to say, especially regarding policy matters. It is also helpful to know if a given candidate has no opinion or only a half-baked opinion on a given subject. 4. Enforce time limits. The time limits for candidate responses to questions are never aggressively enforced. This is particularly irritating when a candidate goes on and on without answering the question asked. (See below.) If the rules of the debate allow for one-minute answers, for example, a candidate’s microphone should be cut off by a studio technician after 60 seconds. Presidents, after all, have to be able to use their time wisely, as they get no more of it than the rest of us. 5. Allow candidates to think about what they are about to say. I suggest that, after a candidate is asked a question, the candidate’s microphone not be turned on for 10 seconds. This allows for collecting one’s thoughts and preparing to answer the question that was actually asked. Of course, each candidate should have suitable time information displayed on the podium. 6. Reward succinctness. If candidates are given, say, a minute to answer, give them credit for time not used. If a candidate answers a question in 50 seconds, let him or her answer another question in 70 seconds. 7. Reward responsiveness. Candidates should not be allowed to avoid answering a question by talking about something else entirely. Nor should the American people have to put up with such a diversionary tactic. If, in 15 seconds, a candidate has not begun addressing the question posed, the microphone should be cut off and the allotted time for the answer forfeited. 8. Stick to policy and procedural questions. Voters want to know about issues such as what the candidate thinks the U.S. to do in the Middle East or the criteria the candidate would use in selecting a Supreme Court nominee. Matters particular to one candidate—haven’t you been inconsistent about one thing or another, for example—are best handled in other fora. 9. Don’t allow rebuttal. 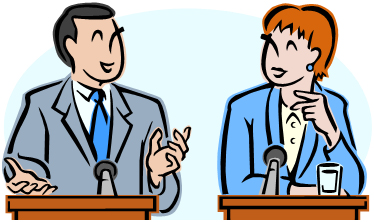 Allowing a candidate rebuttal time whenever his or her name is mentioned interrupts the flow of the debate. Rebuttals can be made later in interviews, speeches, or press releases. 10. Encourage truth-telling. This is a difficult suggestion to implement, but it is well worth looking for a mechanism to do so. Political candidates are notorious for shading the truth, and many assertions of candidates are debatable. 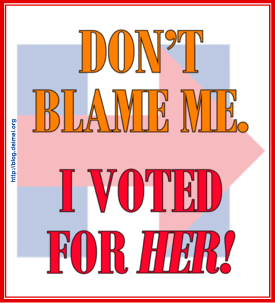 On the other hand, candidates are not above trying to get away with outright lies. (Carly Fiorina’s story of the nonexistent Planned Parenthood video that she swears she saw is a good example of this.) Debates should employ neutral fact-checkers. Admittedly, fact-checking is difficult to so and to display—particularly on radio—on the fly. Perhaps a good mechanism would be a follow-up program on the same network a night or two later. Video of clearly false statements could be shown along with discussion of the truth by experts. Here is a place where rebuttal may be appropriate. Objectivity is both important here and difficult to achieve, but voters need to know when a candidate is espousing an outright lie.